I saw this icon recently at an exhibition at the Ballarat Art Gallery and was utterly transfixed. This particular piece is probably 15th to 17th century and is held in a private collection in Sydney. 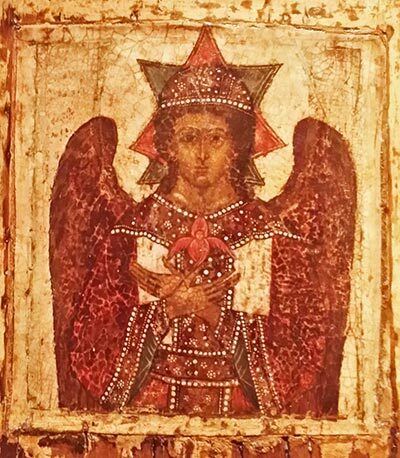 Known in Russia as Spas Blagoe Molchanie or ‘The Saviour of the Blessed Silence’ or alternatively ‘The Angel of Great Counsel’, it is an example of a complex iconographic type that is also represented in Greek iconography and associated with Hesychia, the personification of silence. I was drawn immediately to the hands crossed over the chest in an elegant, star-shaped nimbus and the little winged seraphim hovering over the hands. Then I noticed the angel wings behind the subject and the star-shaped crown on the head. This is an icon of Christ, a young, beardless Christ. But, unusually, it represents Christ as an angel or messenger, the angel of the blessed silence – ‘angelos’, the word from which angel is derived, is the Greek word for messenger. 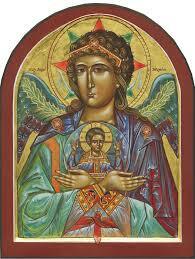 This icon is deeply mystical and symbolic. Christ is wearing an eight-pointed crown which is known in iconography as the star of the Ancient of Days and symbolises the six days of creation, the seventh day of rest and the Day of Eternity, which was there before creation and is essentially the eternal now of God. This is the Christ of John’s prologue, the eternally existing Word. The crown comprises two superimposed squares, one red, denoting the Passion, and the other olive green, denoting the spirituality of the Trinity. The little seraphim hovering above the hands is a symbol of the Nativity, but like many iconographic images, links the birth and the death of Christ, for this is the image of a crucified seraphim. For comparison I include the image below of a modern Greek icon of Hesychia. My main source of information is the official catalogue notes from the exhibition: Eikon by Gordon Morrison, Alexander Grishin and Sophie Matthiesson.